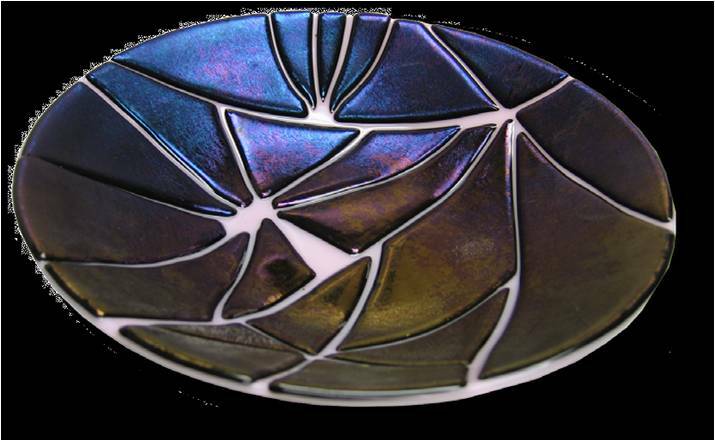 Every fused glass artist knows – breakage happens. If you mix incompatible glass – if you cool too quickly – you can get stress fractures and cracks. It can be very disappointing – especially if you’ve already put time & effort into the piece – but it is not the end. Don’t cry over broken glass – it’s just an opportunity to recycle it & start fresh! The next time you raise a glass, stop and be aware that you are holding a small miracle in your hand. That ordinary drinking glass, made of sand and silica, heated over 2000 degrees, is an amazing feat of technology, physics, poetry, and determination. It was on my things-to-try-before-I-die list, so I saved up my birthday and Christmas gift certificates, added some of my own cash, and did something I’ve always wanted to do: I took a glassblowing class. I tried a 6-hour intensive glass-blowing class this weekend at Third Degree Glass Factory in St. Louis, Missouri. I have always loved glass, been intrigued with glassblowing, thought because my Swedish ancestors worked in glass factories, maybe I would have the knack. Sadly, I learned that gaffer skills are not hereditary. I also learned that glassblowing is hot, hard, fast-paced work, and not for someone who is no longer a young’n and fairly out of shape. I have tried flameworking (lampworking), stained glass, fused glass, and now hot shop and glassblowing. So far fused glass is where I excel. So be it. Even with the teacher’s help, I couldn’t seem to control the hot glass very well. I could not master techniques, esp. the blowing part. And, as the day went on, and I became more tired and frustrated, I could not hold the heavy rods steady and level, which is very important. I did fine on the first technique, making a punty. A small glob of glass, gently shaped. Next, trying to make a marble, things started to go wrong. I couldn’t figure out the logistics of sitting on the workbench with a long hot rod in my hands. Then I couldn’t make my jack line; I was holding the tool wrong. I set the jacks down to get a tweezers-full of water to cool it off, didn’t quite make steady contact with the glass, was going to re-do my jack-line, but picked up the hot end of the jacks & burned my left hand. I put ice on it, but it blistered & hurt for the next hour or so. After the burn, every time I had to get near the furnace or glory hole, my hand burned and I literally couldn’t take the heat. It hurt like hell! I was determined, I kept trying, but I was in pain. That’s when I couldn’t hold the rods steady anymore. I’d touch the door of the glory hole & get schmutz in my glass. One mistake led to another. 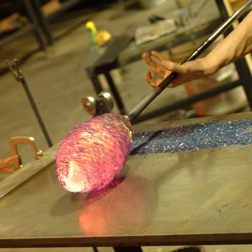 Trying to keep the molten glass on center was a challenge – it goes wonky so very quickly, and it is so important. A good life lesson – staying centered is hard, but necessary – once you are off-center, it’s hard to find the right balance again. I couldn’t get the blow & cap procedure. I couldn’t make my air bubble. I wanted to – it looked so cool when others did it – the bubble expands, it is molten magic. I didn’t have my whole thumb in my mouth, or I couldn’t get a good seal, or – I never did figure it out. I couldn’t blow from my diaphragm, I ran out of air, I couldn’t control my breathing. We gave up on me getting a bubble, so I couldn’t make a glass. We took my ruined glob of glass, folded it in on itself, left it an organic lump, and let it go at that. I ended up with a $165 paperweight. Still, I don’t regret the experience. I still love glass and think it is most magic. I admire and RESPECT those who can move with the flow and make something beautiful from heat & gravity & constant energy. I admit it – I couldn’t keep up. I came home and hugged my kiln – so much easier for me. Warm, kiln-formed glass is a much slower process, that allows for greater control, and I sit down most of the time. I still have so much to explore and learn, so many things I still want to try with fused glass, the possibilities are endless. We try – we learn – and sometimes, we realize our limitations and applaud those who do what we can only dream. Well, I did it. I bought myself a glass kiln. I plunked down $505 cash money and took my baby home. Can’t wait to fire her up this weekend and try her out. i think I will name her Annie, in honor of Ann Badesh, who allowed me to have my jewelry show at her delightful restaurant, My Just Desserts, so I could earn enough money to invest in myself and my art by buying this power tool for the glass artist. She’s a beauty – bigger than the ones I used in class, with a hinged lid, and easy access. I think we’ll make beautiful jewelry together. Glass, of course. Maybe I will learn copper enameling too. Why the hell not? I am mostly harmless, and anyway, I’ve already got the fire extinguisher and carbon monoxide detector set up. I want to capture the beauty I am learning to see, by allowing myself to think and feel like an artist, in glass creations. Pendants, earrings, objects d’art – natural wonders, butterflies and dragonflies and color collages, with a bit o’ frit, and maybe a touch of gold… My work is not precise or perfect, but it does have a playful quality. I enjoy experimenting, trying things out, putting unusual combinations together – and to my surprise they work better than I could have planned! There’s a sense of “second chance” to it – I think anyway – I may not be Dale Chihuly, but I do enjoy carrying on the glassmakers tradition of my Swedish ancestors. I can’t wait to go play and burn something beautiful this weekend!